I’m looking at the SLASH PRO UDP printer for a small scale production of miniatures and terrain for tabletop gaming. I haven’t seen any example prints of it and I have a few concerns before I pull the trigger (it’s between that and the Kudo3d Titan 2). What support is currently offered? Most importantly, what prints are ill-suited to UDP printing? The UDP printing/speed of this machine is what I find most attractive, but if I can’t utilize that feature I’m not sure if it will be worthwhile. How are y’all liking your machines? I'm looking at the SLASH PRO UDP printer for a small scale production of miniatures and terrain for tabletop gaming. I haven't seen any example prints of it and I have a few concerns before I pull the trigger (it's between that and the Kudo3d Titan 2). Most importantly, what prints are ill-suited to UDP printing? The UDP printing/speed of this machine is what I find most attractive, but if I can't utilize that feature I'm not sure if it will be worthwhile. How are y'all liking your machines? I was considering Kudo3d Titan machine but ended up with UNIZ. The machine and the customer service is getting improved but still long way to catch up. I only make jewelry and pretty happy with the machine for the price. Check the link to see this UDP spec will suit your application. Thank you for the quick response! I’ve been looking through that and based on what I’ll be printing I don’t believe I’ll have an issue with that. I’ve been playing with the Uniz software to get a sense of production capacity and I’m a bit confused with the UDP setting itself. 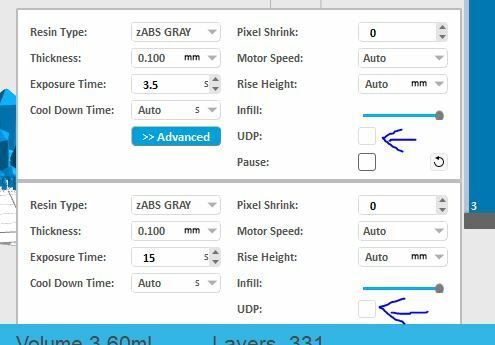 It appears greyed out to me – do I need to change some settings to enable it at all or is it always active on the printer? Thank you for the quick response! I've been looking through that and based on what I'll be printing I don't believe I'll have an issue with that. I've been playing with the Uniz software to get a sense of production capacity and I'm a bit confused with the UDP setting itself. It appears greyed out to me - do I need to change some settings to enable it at all or is it always active on the printer? The UDP checkbox is disabled for all resins except the two UDP resins. I’m a little surprised if minis would really never have more than 2mm thick cross sections, since they are typically printed at an angle, like everything else on a resin printer, and they’re also usually small enough that they aren’t hollowed. In my experience, the orange udp resin is unusable and the grey works but ultimately isn’t high enough quality for high detail. There is also significant background curing with grey udp to the point that I have to clean the vat of cured resin after every print, no matter how quick. Occasionally, a cured film will attach to the part as well. I'm a little surprised if minis would really never have more than 2mm thick cross sections, since they are typically printed at an angle, like everything else on a resin printer, and they're also usually small enough that they aren't hollowed. In my experience, the orange udp resin is unusable and the grey works but ultimately isn't high enough quality for high detail. There is also significant background curing with grey udp to the point that I have to clean the vat of cured resin after every print, no matter how quick. Occasionally, a cured film will attach to the part as well. Ive printed a couple of smallish figures with Grey UDP myself. Avoid hollowing. I tried that and it seems to result in surface defects at a pretty high rate. The first time i printed, i didnt print the with the UDP checkbox checked. The print went really well (but took about 1hr 45 min for a figure with 600ish layears at 0.2mm). I printed the same figure (but scaled 1.4x where it had 1056 layers at 0.1mm) and it finished in 45 minutes with UDP mode checked. (same resin). However i had also tried hollowing on that figure so the print didnt come out good at all. I think the problem was the hollowing though, not the UDP mode.